Unquestionably, the best aspect of the recent explosion of smart devices and gadgets in the home is the creative way in which developers and designers are creating digital solutions to enhance our lives and solve our challenges. There is no better an example of this than what is occurring in the bedroom. So many of us deal with sleep issues at some point during our lives. 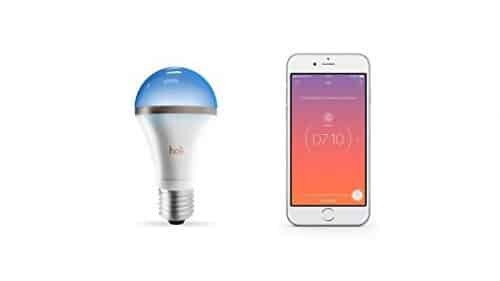 Now, there are countless sleep gadgets on the market that will help us conquer our sleepless nights and keep us well rested always. 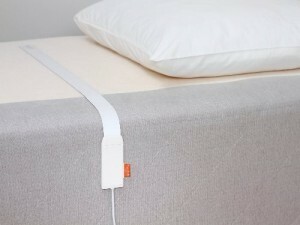 Here are some of the more interesting Bedroom Gadgets I have been able to dig up in my internet travels. As always, I will be adding to and updating this post regularly, so be sure to check back often. Alarm has Normal alarm mode and Exercise alarm mode: 1. Normal alarm mode: when the alarm goes off in Normal alarm mode, one upward swing of the dumbbell will shut off the alarm. 2. Exercise alarm mode: when alarm goes off in Exercise mode, the LCD screen will display the remain number of lifts necessary to turn off the alarm. 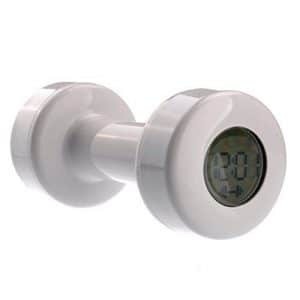 The clock will count down from 30 after every repetition – On /off Alarm setting – You need to lift it by 30 times when it alarms. 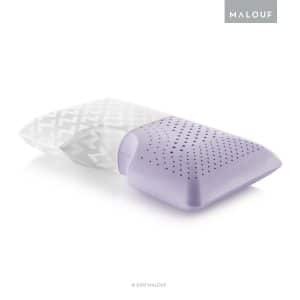 Harness the benefits of aromatherapy with the Z Shoulder ZONED DOUGH Memory Foam Pillow with Lavender. 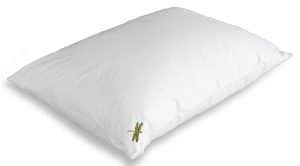 Known to induce sleep and regulate sleep cycles, this relaxing scent comes infused in the pillow. Our included 2 ml spritzer allows you to refresh the aroma when needed. 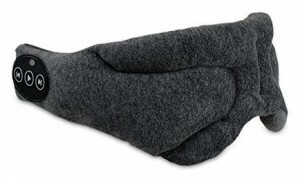 The unique shoulder recess is designed specifically for side sleepers and helps to cradle the head while supporting the neck. The design also helps reduce tossing and turning. 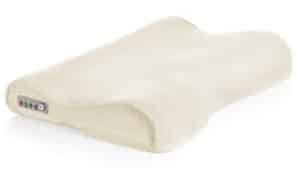 These pillows are therapeutic tools designed to play music through Intrasound Technology, converting sound into vibrations that conduct to the inner ear. This process triggers you body’s nervous system to relax, allowing your body to calm down and prepare for sleep. 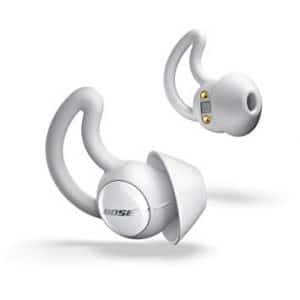 And because the music is transmitted via bone conduction, you relax to the music while your partner hears nothing at all! Built- in human body passive infrared (PIR) motion sensor light, automatic turn on and shut off by human induction in the dark environment. 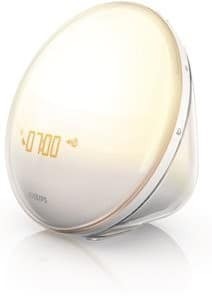 The sensor has auto shut-off timer from 30 sec-10 min adjustment. You can set the preference as you need. When stepping out of bed, a warm soft glow of light will turn on to guide you safely across the room, with no disturbing glare to wake others and no fumbling to find the light switch in the dark. 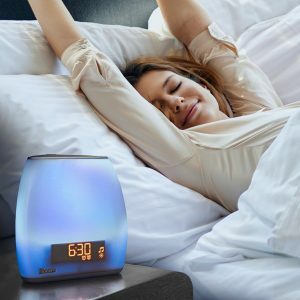 The iHome ZENERGY Bedside Sleep Therapy Machine, offers you all the needed tools for a better sleep using light and sound therapy that matches the mood you’re feeling. 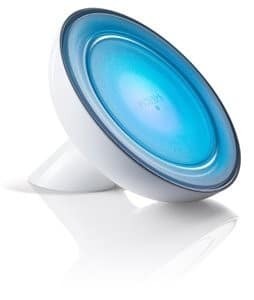 The multiple settings allow you to move from fast pulses to swirling lights of wonder. 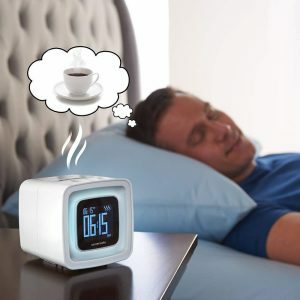 The soft and wonderful white noise sounds of the iHome ZENERGY Bedside Sleep Therapy Machine, will surely make you feel like you’re on a faraway land away from the daily grind of your normal schedule. There’s no better way to start the morning than with a steaming mug of tea. Legendary British housewares brand Swan knows this, which is why they’ve updated its iconic Teasmade appliance and brought it in to the here and now. Featuring a revised sleek and sophisticated design but maintaining the aesthetics that made it so popular upon its inception, the Swan Teasmade is not only a stylish addition to the bedroom but multi-functional too. Never over-sleep again thanks to the built-in alarm. Nightingale, the world’s first smart sleep system, offers customers cutting-edge sound masking technology for their bedrooms. 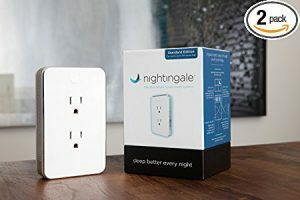 Developed by acoustic engineers, Nightingale reduces wake occurrences by masking common indoor and outdoor noises. Clinically proven to help users fall asleep 38% faster, Nightingale is one of the most effective sleep solutions available. The only mattress designed with over 1.8 million hours of sleep data. 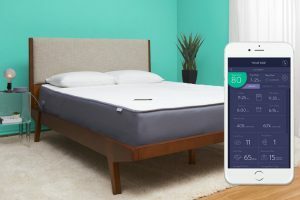 Eight took one of the best features of all traditional foam mattresses, along with over a million hours of sleep data, creating the ultimate sleeping experience. Porkfolio is the world”s smartest piggy bank. 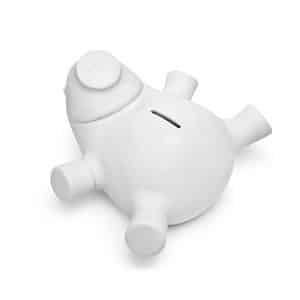 It wirelessly connects to an app on your mobile device so you can track your balance and set financial goals from afar. Its nose lights up in celebration every time a U.S. coin is inserted and it holds up to $100 in quarters. 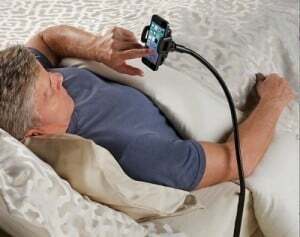 This is the flexible arm that holds a smartphone at the perfect height for hands-free video-chatting, reading, or movie-watching in bed. 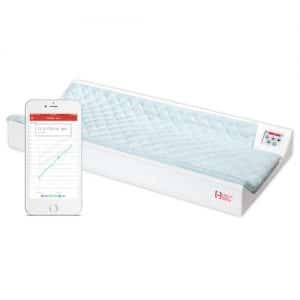 Its 3/16″-thin, 9″ L plastic base slips imperceptibly under a mattress, while its cushioned mount narrows or widens easily to firmly support any type of phone up to 3 1/2″ W without clips, adhesives, or other damaging fasteners. Some like it hot. Some need it cool. Some just want to stay dry and others need different sleep temperatures than their partners. That’s why everyone loves their BedJet! 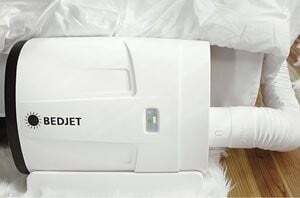 Using advanced technology the BedJet sends a gentle and quiet stream of air directly into your bed for powerful cooling and warming comfort. SleepCompanion helps you understand the factors that may disrupt the quality of your nights such as the temperature or the noise level in your bedroom while its companion app gives you personalized and actionable advices to get the best of your nights. 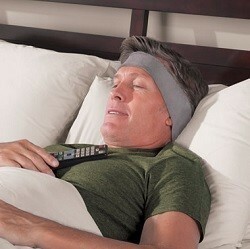 Because your deserve a better sleep! Waking up has never been made easier. Tick Tock Air, one of Edifier’s Tick Tock series allows for any Bluetooth enabled device with alarm capabilities. 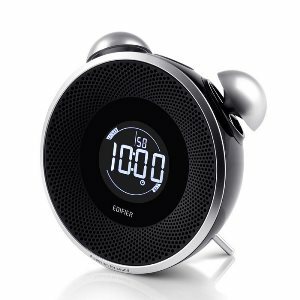 The retro designed alarm clock features a front firing speaker and two 360 degree omni-directional tweeters allow for multi-directional rich sound that can be controlled with ease using the navigation, input selection and volume control buttons located on the top of the clock. Tick Tock Air also come with an auxiliary input jack and FM radio for other media applications. 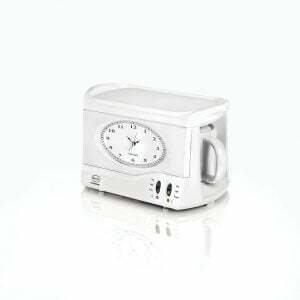 This is the alarm clock that gently wakes you with the aroma of coffee. 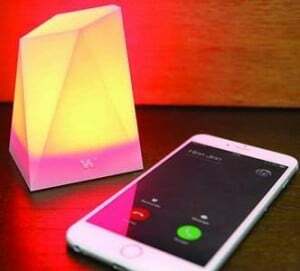 It diffuses the fragrance for three minutes using an interchangeable scent cartridge and then engages a light and an audio alarm by playing one of five melodies. With a snooze button and backlight. Includes seven scent cartridges (coffee, peppermint, orange juice, fresh cut grass, seaside, pine woods, and apple-cinnamon); each one provides 30 three-minute wake sessions.